The definitive study of the equipment and organization of the Allies bomber units throughout the war, illustrated with details of Allied bombers and their markings. Germany: The first flight of Willy Messerschmitt's Bf-109 fighter takes place. The Bf-109 fighter proves so successful that over 30,000 will ultimately be built before the end of the war. Germany: Eva Braun attempts suicide by taking Phanodorm, a drug usually prescribed to help with sleeping. UK: Neville Chamberlain is appointed Prime Minister of the United Kingdom. He will serve as such until 10 May 40. Germany: The forerunner to the modern Volkswagen automobile company, Gesellschaft zur Vorbereitung des Deutschen Volkswagens mbH, is established. Spain: Day 316 of 985 of the Spanish Civil War. CBI - China: Day 111 of 124 of the Battle of Henan. Germany: Adolf Hitler orders the military to prepare for an invasion of Czechoslovakia and mobilizes 96 divisions. Germany: Ousted Austrian Chancellor Kurt Schuschnigg, who has been under house arrest since 12 Mar 1938, is moved to Gestapo headquarters in Vienna, Austria. Spain: Day 681 of 985 of the Spanish Civil War. CBI - China: Day 326 of 2,987 of the 2nd Sino-Japanese War. Day 111 of 124 of the Battle of Henan. Japanese bombers attack Guangzhou, Guangdong, China, killing 750 and wounding 1,350. CBI - China: Day 691 of 2,987 of the 2nd Sino-Japanese War. CBI - Mongolia: Day 18 of 129 of the Battle of Khalkhin Gol, a border dispute between the Soviet Union and Japan. USA: The National Defense Advisory Committee is established in the US as a group of advisers to US President Roosevelt. USA: The American ambassador to France sends a telegram asking President Roosevelt to dispatch a cruiser to Bordeaux, France, with weapons for the French police to quell a feared Communist uprising and to embark French and Belgian gold reserves. Atlantic: German sub U-37 sinks French liner BRAZZA 100 miles west of Cape Finisterre, Spain. ETO - Norway: Day 50 of 63 of the Battle of Norway. British, French, Norwegian and Polish troops capture Narvik. ETO - Belgium: Day 19 of 19 of the Battle of Belgium. King Léopold III formally surrenders to the Nazis. ETO - France: Day 19 of 44 of the Battle of France.The Germans trap the French 1st Army at Lille. At Abbeville, one French tank named JEANNE D'ARC receives 90 hits while gallantly fighting off a German tank attack. Day 2 of 9 of Britain's Operation DYNAMO, the evacuation of Dunkirk. 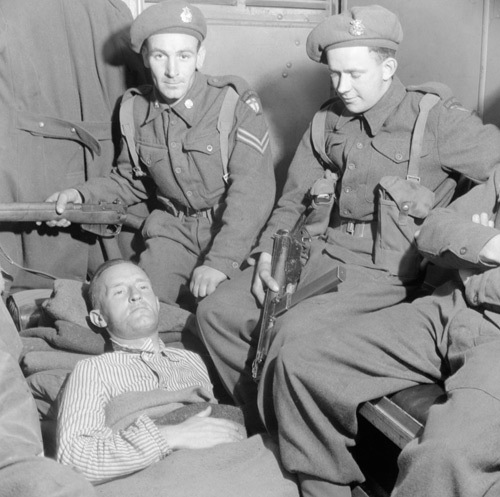 Another 17,264 troops are evacuated to England from the beaches and harbor. The first "little ships" arrive today to participate. They include speedboats, Thames vessels, car ferries, pleasure craft and motor lifeboats. CBI - China: Day 1,057 of 2,987 of the 2nd Sino-Japanese War. Day 196 of 381 of the Battle of South Guangxi. Day 28 of 49 of the Battle of Yichang. USA: Franklin Roosevelt says the Neutrality Act needs to be repealed. UK: British Lord Woolton announces experimental egg rationing and further restrictions on fish and milk. Atlantic: German bombers attack the HMS TARTAR and HMS MASHONA 100 miles west of Ireland. The HMS TARTAR rescues the survivors of the HMS MASHONA then other destroyers scuttle her with gunfire. Atlantic: German sub U-107 sinks the Greek ship PAPALEMOS off Sierra Leone, British West Africa. MTO - Greece: Day 9 of 13 of the Battle of Crete. British and Commonwealth troops begin evacuating from the port of Sphakia on the southern coast. MTO - Libya: Day 49 of 256 of the Siege of Tobruk. Middle East: Day 27 of 30 of the Anglo-Iraqi War in Iraq. The Indian 20th Brigade reaches the city of Ur. East Africa: Day 353 of 537 of Italy's East African campaign in the lands south of Egypt. CBI - China: Day 1,422 of 2,987 of the 2nd Sino-Japanese War. Atlantic: Day 135 of 169 of Germany's Second "Happy Time," during which U-boats sink 609 Allied ships with little risk. The US freighter SYLVAN ARROW, damaged by U-155 on the 20th, sinks while under tow. Germany: 200 Poles are taken from Warsaw to the village of Magdalenka and shot. Among them are three women who were brought on stretchers from Pawiak prison hospital. Russian Front - North: Day 263 of 872 of the Siege of Leningrad. Russian Front - North: Day 24 of 658 of the Siege of the Kholm Pocket. Russian Front - South: Day 17 of 17 of the 2nd Battle of Kharkov, Ukraine. With no way out, over 200,000 Soviets surrender. Russian Front - South: Day 211 of 248 of the Siege of Sevastopol, Crimean Peninsula. MTO - Libya: Day 3 of 27 of the Battle of Gazala. The Allies counter-attack, hoping to envelope the Axis on three sides. East Africa: Day 24 of 186 of the Battle of Madagascar. CBI - China: Day 1,787 of 2,987 of the 2nd Sino-Japanese War. Day 14 of 124 of Japan's Zhejiang-Jiangxi Campaign, launched to punish anyone suspected of aiding the Doolittle raiders in China. Roughly 250,000 Chinese will be killed. PTO - Alaska: US 11th Air Force flies the first armed reconnaissance from the secretly constructed airfield at Unmak Island in the Aleutian Chain, but finds no sign of the enemy. PTO - Malaya: Day 99 of 357 of the Battle of Timor Island. PTO - Midway: The Japanese Navy finally changes their code books, but they are too late. Their secrets concerning Midway have already been decoded by the US and the opposing fleets are already sailing toward each other. PTO - New Guinea: US 5th Air Force B-26s attack the airfield at Lae. Russian Front - North: Day 628 of 872 of the Siege of Leningrad. Russian Front - North: Day 389 of 658 of the Siege of the Kholm Pocket. MTO - Italy: US 9th Air Force RAF Liberators night bomb at Augusta. During the day, US B-24s hit Foggia Airfield and the surrounding area. MTO - Italy: Day 7 of 20 of the naval and aerial bombardment of Pantelleria Island. MTO - Italy: US 12th Air Force RAF Wellingtons night bomb airfields in Sardinia. During the day US planes bomb at Leghorn and on Pantelleria. PTO - New Guinea: Day 37 of 148 of the 2nd Battle of Lae-Salamaua. US 5th and 13th Air Forces provide air support. CBI - China: Day 2,152 of 2,987 of the 2nd Sino-Japanese War. Day 17 of 23 of the Battle of West Hubei. US 14th Air Force provides air support. PTO: Day 2 of 47 adrift in a raft for the survivors of B-24 GREEN HORNET that crashed 850 miles from Hawaii. PTO - Alaska: Day 356 of 435 of the Battle of Kiska, Aleutian Islands. Day 18 of 20 of the Battle of Attu. The US continues mopping up, but the Japanese refuse to surrender. US 11th Air Force provides air support. PTO - Gilbert Islands: US 10th Air Force B-24s attack targets on Abemama Island. ETO - Germany: US 8th Air Force B-17s and B-24s bomb oil related targets. A crippled B-24 of the 445th Bomb Group, returning from a mission to Merseburg, makes history's second known parachute-assisted landing by rigging two chutes to their waist gun mountings. Crew 2366 was flying their 5th combat mission, this one deep into Germany at the synthetic oil refinery at Merseburg. They encountered an extraordinary amount of anti-aircraft flak on the approach to the heavily protected target. After dropping their bombs, a large piece of flak shot into the bomb bay and punctured several hydraulic lines, leaking out fluid essential to the operation of the landing gear, brakes and wing flaps. On their return over the Channel to their base at Tibenham, England, the crew discovered their predicament and had to decide what to do. One of the crew members had read a story in Stars and Stripes about a crew's use of parachutes to brake their plane in a similar circumstance and suggested the idea. They rigged the parachute "brakes" by harnessing two packed chest parachutes to the .50 caliber machine gun mountings in the waist, one on each side of the plane and stationed a man at each parachute with his hand on the rip cord. After alerting the Tibenham tower to their predicament and their plan, they lowered the landing gear manually and made the final approach without being able to slow the speed with the flaps. As the wheels touched the runway, the assigned crew member at each waist window yanked the rip cord of the parachute, coordinating with each other in order to have a balanced braking of the plane. The parachute at the right hand window popped open perfectly and ballooned behind the tail assembly. The parachute on the left side, however, snagged on the gun sight and failed to open. Fortunately, the opened parachute on the right provided enough braking power to stop the plane before it could reach the end of the runway. ETO - Germany: US 8th Air Force B-17s attempt the use of GB-1 "Grapefruit" glide bombs for the first and only time. Wildly inaccurate, most miss their targets by as much as 15 miles, unintentionally killing 82 and injuring 1,500. ETO: US 9th Air Force B-26s and A-20s bomb marshalling and naval yards, railway bridges and V-weapon sites in France and Belgium. Russian Front - North: Day 117 of 191 of the Battle of the Narva Isthmus, Estonia. Both German and Soviet troops remain in their defensive positions. Russian Front - South: Day 51 of 60 of the Battle of Romania, 1st Jassy Offensive. MTO - Yugoslavia: US 15th Air Force bombs targets at Niksic. MTO - Italy: Day 128 of 136 of the Battle of Anzio. RAF and US Air Forces provide air support. CBI - Burma: Day 85 of 166 of the UK's Operation THURSDAY. Monsoon season begins and bogs down all operations in Burma. CBI - Burma: Day 80 of 147 of the Battle of Myitkyina. US 10th Air Force provides air support. Monsoon season begins and bogs down all operations in Burma. CBI - Burma: Day 58 of 302 of the Chinese Salween Offensive. US 14th Air Force provides air support. Monsoon season begins and bogs down all operations in Burma. CBI - China: Day 2,518 of 2,987 of the 2nd Sino-Japanese War. Day 42 of 259 of Japan's Operation ICHI-GO. CBI - India: Day 82 of 118 of the Battle of Imphal-Kohima. PTO - Alaska: US 11th Air Force bombs Shimushu and Matsuwa Islands. PTO: Each of the 11 crewmen of the B-24 GREEN HORNET, which went down 27 May 43, is officially listed as presumed KIA. Two of the men have survived after 47 days adrift in a life raft before becoming POWs of the Japanese. One of the men is Olympic star Louis Zamperini. PTO - Mariana Islands: The US 7th Air Force bombs targets at Saipan and Guam. PTO - Marshall Islands: The US 7th Air Force bombs targets in the Jaluit and Mille Atolls. PTO - New Guinea: Day 2 of 83 of the Battle of Biak. 5th Air Force provides air support. PTO - New Guinea: Day 166 of 597 of the Battle of New Britain. US 13th Air Force provides air support. PTO - New Guinea: Day 37 of 481 of the Battle of Western New Guinea. 5th Air Force provides air support. PTO - Solomon Islands: Day 210 of 295 of the Battle of the Bougainville Islands. US 13th Air Force provides air support. 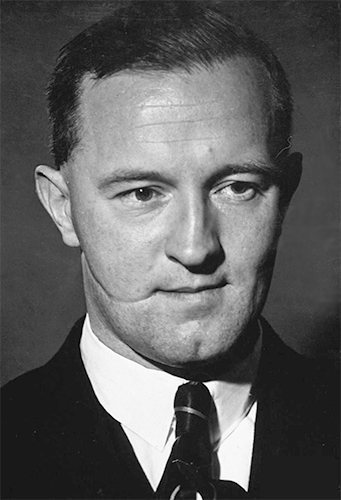 Denmark: Brooklyn-born William Joyce, the fascist Nazi propagandist whose absurd radio broadcasts to Britain during the war earned him the nickname "Lord Haw Haw" is captured by British troops. He will be hanged for treason in 1946, being taken to owe allegiance to the UK by his possession of a British passport, a document to which, ironically, he was not entitled. William Joyce, aka "Lord Haw Haw"
Having become a target of the Irish Republican Army (IRA) for aiding the Black and Tans in the Irish War for Independence, Joyce fled to England and developed an interest in fascism. William Joyce was Irish by blood, American by birth and carried a British passport. He had worked with Oswald Mosely's British Fascist Party, a political party in Britain that attempted to copy the Nazi Party in Germany. In 1924, while stewarding a Conservative Party meeting in England, Joyce was attacked and received a deep razor slash that ran across his right cheek. It left a permanent scar which ran from the earlobe to the corner of the mouth. Haw Haw started off his broadcasts with "Germany calling, Germany calling," the call sign of a Hamburg radio station which broadcast nightly news bulletins in English to the British people. The voice of the speaker belonged to William Joyce, nick-named Lord Haw Haw by the "Daily Express." In fact, possibly as many as three men were Lord Haw Haw with Joyce being the most infamous. Joyce's broadcasts were anti-Semitic and poked fun at the British war leader Winston Churchill. It is thought that on average six million people listened to Joyce each broadcast. Many found the broadcasts so absurd that they were seen as a way of relieving the tedium of life in Britain during the war. With the fall of Germany, Joyce fled to Denmark, where British intelligence soldiers heard him speaking English in a cafe and instantly recognized his voice and questioned him. Believing him to be armed, one soldier shot him in the buttocks as he reached for his false passport. He was hanged on 03 Jan 46 in Wandsworth Prison, the second to the last person hanged for an offense other than murder in the UK. The last was Theodore Schurch, executed the next day. Atlantic: The British Admiralty ends the convoy system in the Atlantic Ocean. CBI - China: Day 2,883 of 2,987 of the 2nd Sino-Japanese War. Day 58 of 91 of the Battle of Zhijiang. US 14th Air Force provides air support. Japanese troops begin pulling out of China. Day 50 of 60 of the Battle of West Hunan (near Zhijiang). Japanese troops continue withdrawing from southern China. PTO - Dutch East Indies: Day 28 of 52 of the Battle of Tarakan Island. PTO - Japan: Day 58 of 83 of the Battle of Okinawa. Kamikaze raids sink the destroyer USS DREXLER. PTO - New Guinea: Day 518 of 597 of the Battle of New Britain. US 10th Air Force provides air support. PTO - New Guinea: Day 402 of 481 of the Battle of Western New Guinea. US 10th Air Force provides air support. PTO - Philippines: Day 220 of 299 of the 2nd Battle of the Philippines, aka the Liberation of the Philippines or the Philippines Campaign. PTO - Philippines: Day 165 of 244 of the Battle of Luzon. 5th Air Force provides air support. PTO - Philippines: Day 80 of 159 of the Battle of Mindanao Island. 5th Air Force provides air support. PTO - Philippines: Day 72 of 135 of the Battle of the Visayas region. US 5th and 7th Air Forces provide air support. The sophisticated, stupefying Nazi propaganda assault on the social and economic fabric of British society through wireless broadcasts.